5 Visits to the U.S.
She was born in Hongkou District, Shanghai, on March 5, 1898, though some biographies give the year as 1897, since Chinese tradition considers one to be a year old at birth. In Shanghai, May-ling attended the McTyeire School for Girls with her sister, Ching-ling. Their father, who had studied in the United States, arranged to have them continue their education in the US in 1907. May-ling and Ching-ling attended a private school in Summit, New Jersey. In 1908, Ching-ling was accepted by her sister Ai-ling's alma mater, Wesleyan College, at age 15 and both sisters moved to Macon, Georgia, to join Ai-ling. However, she could not get permission to stay on campus as a family member nor could she be a student because she was too young. May-ling spent the year in Demorest, Georgia, with Ai-ling's Wesleyan friend, Blanche Moss, who enrolled May-ling as an 8th grader at Piedmont College. In 1909, Wesleyan's newly appointed president, William Newman Ainsworth, gave her permission to stay at Wesleyan and assigned her tutors. She briefly attended Fairmount College in Monteagle, Tennessee in 1910. May-ling was officially registered as a freshman at Wesleyan in 1912 at the age of 15. She then transferred to Wellesley College two years later to be closer to her older brother, T. V., who, at the time, was studying at Harvard. By then, both her sisters had graduated and returned to Shanghai. She graduated from Wellesley as one of the 33 "Durant Scholars" on June 19, 1917, with a major in English literature and minor in philosophy. She was also a member of Tau Zeta Epsilon, Wellesley's Arts and Music Society. As a result of being educated in English all her life, she spoke excellent English, with a pronounced Georgia accent which helped her connect with American audiences. Soong Mei-ling met Chiang Kai-shek in 1920. 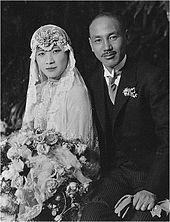 Since he was eleven years her elder, already married, and a Buddhist, Mei-ling's mother vehemently opposed the marriage between the two, but finally agreed after Chiang showed proof of his divorce and promised to convert to Christianity. Chiang told his future mother-in-law that he could not convert immediately, because religion needed to be gradually absorbed, not swallowed like a pill. They married in Shanghai on December 1, 1927. While biographers regard the marriage with varying appraisals of partnership, love, politics and competition, it lasted 48 years. The couple had no children. In 1928, she was made a member of the Committee of Yuans by Chiang. They renewed their wedding vows on May 24, 1944 at St. Bartholomew's Church in New York City. Polly Smith sang the Lord's Prayer at the ceremony. Madame Chiang initiated the New Life Movement and became actively engaged in Chinese politics. She was a member of the Legislative Yuan from 1930 to 1932 and Secretary-General of the Chinese Aeronautical Affairs Commission from 1936 to 1938. In 1945 she became a member of the Central Executive Committee of the Kuomintang. As her husband rose to become Generalissimo and leader of the Kuomintang, Madame Chiang acted as his English translator, secretary and advisor. She was his muse, his eyes, his ears, and his most loyal champion. During World War II, Madame Chiang tried to promote the Chinese cause and build a legacy for her husband on a par with Roosevelt, Churchill and Stalin. Well-versed in both Chinese and Western culture, she became popular both in China and abroad. Her prominence led Joseph Stilwell to quip that she ought to be appointed minister of defense. In 1931, Soong Mei-ling had a villa built for her on the east side of Nanjing. Located a few hundred meters east of the Sifangcheng Pavilion of the Ming Xiaoling Mausoleum, the villa still exists, and is commonly known as Meilinggong (美龄宫), "Mei-ling Palace". Although Soong Mei-ling initially avoided the public eye after marrying Chiang, she soon began an ambitious social welfare project to establish schools for the orphans of Chinese soldiers. The orphanages were well-appointed: with playgrounds, hotels, swimming pools, a gymnasium, model classrooms, and dormitories. Soong Mei-ling was deeply involved in the project and even picked all of the teachers herself. There were two schools - one for boys and one for girls—built on a thousand-acre site at the foot of Purple Mountain, in Nanjing. She referred to these children as her "warphans" and made them a personal cause. The fate of the children of fallen soldiers became a much more important issue in China after the beginning of the war with Japan in 1937. In order to better provide for these children she established the Chinese Women's National War Relief Society. On February 18, 1943, she addressed both houses of the US Congress. 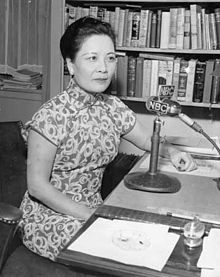 Soong Mei-ling made several tours to the United States to lobby support for the Nationalists' war effort. She drew crowds as large as 30,000 people and in 1943 made the cover of TIME magazine for a third time. 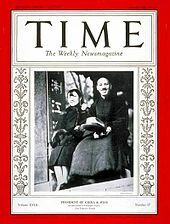 She had earlier appeared on the October 26, 1931 cover alongside her husband and on the January 3, 1937 cover with her husband as "Man and Wife of the Year"
Both husband and wife were on good terms with Time magazine senior editor and co-founder Henry Luce, who frequently tried to rally money and support from the American public for the Republic of China. On February 18, 1943, she became the first Chinese national and the second woman to address both houses of the US Congress. After the defeat of her husband's government in the Chinese Civil War in 1949, Madame Chiang followed her husband to Taiwan, while her sister Soong Ching-ling stayed in mainland China, siding with the communists. Madame Chiang continued to play a prominent international role. She was a Patron of the International Red Cross Committee, honorary chair of the British United Aid to China Fund, and First Honorary Member of the Bill of Rights Commemorative Society. After the death of her husband in 1975, Madame Chiang assumed a low profile. She was first diagnosed with breast cancer in 1975 and would undergo two mastectomies in Taiwan. She also had an ovarian tumor removed in 1991. 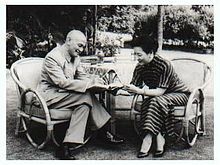 Chiang Kai-shek was succeeded to power by his eldest son Chiang Ching-kuo, from a previous marriage, with whom Madame Chiang had rocky relations. In 1975, she emigrated from Taiwan to her family's 36 acre (14.6 hectare) estate in Lattingtown, New York, where she kept a portrait of her late husband in full military regalia in her living room. She kept a residence in Wolfeboro, New Hampshire, where she vacationed in the summer. Madame Chiang returned to Taiwan upon Chiang Ching-kuo's death in 1988, to shore up support among her old allies. However, Chiang Ching-kuo's successor, Lee Teng-hui, proved more adept at politics than she was, and consolidated his position. She again returned to the U.S. and made a rare public appearance in 1995 when she attended a reception held on Capitol Hill in her honor in connection with celebrations of the 50th anniversary of the end of World War II. Madame Chiang made her last visit to Taiwan in 1995. In the 2000 Presidential Election on Taiwan, the Kuomintang produced a letter from her in which she purportedly supported the KMT candidate Lien Chan over independent candidate James Soong (no relation). James Soong never disputed the authenticity of the letter. Soong sold her Long Island estate in 2000 and spent the rest of her life in a Gracie Square apartment on the Upper East Side of Manhattan owned by her niece. An open house viewing of the estate drew many Taiwanese expatriates. When Madame Chiang was 103 years old, she had an exhibition of her Chinese paintings in New York. Madame Chiang died in her sleep in New York City, in her Manhattan apartment on October 23, 2003, at the age of 105. Her remains were interred at Ferncliff Cemetery in Hartsdale, New York, pending an eventual burial with her late husband who was entombed in Cihu, Taiwan. The stated intention is to have them both buried in mainland China once political differences are resolved. Madame Chiang was a close friend of the United States throughout her life, and especially during the defining struggles of the last century. Generations of Americans will always remember and respect her intelligence and strength of character. On behalf of the American people, I extend condolences to Madame Chiang's family members and many admirers around the world. As a fluent English speaker, as a Christian, as a model of what many Americans hoped China to become, Madame Chiang struck a chord with American audiences as she traveled across the country, starting in the 1930s, raising money and lobbying for support of her husband's government. She seemed to many Americans to be the very symbol of the modern, educated, pro-American China they yearned to see emerge—even as many Chinese dismissed her as a corrupt, power-hungry symbol of the past they wanted to escape. Life magazine called Madame the "most powerful woman in the world." 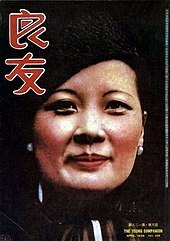 Liberty magazine described her as "the real brains and boss of the Chinese government." Clare Boothe Luce compared her to Joan of Arc and Florence Nightingale. Ernest Hemingway called her the "empress" of China. 1995: US senators held a reception for Soong Mei-ling in recognition of China's role as a US ally in World War II. ^ The New York Times gives her place of birth as Shanghai, while the BBC and Encyclopædia Britannica give it as Wenchang, Hainan island (which was then part of Guangdong Province). ^ a b While records at Wellesley College and the Encyclopædia Britannica indicate she was born in 1897, the Republic of China government as well as the BBC and the New York Times cite her year of birth as 1898. [clarification needed] The New York Times obituary includes the following explanation: "Some references give 1897 as the year because the Chinese usually consider everyone to be one year old at birth." cf: East Asian age reckoning. However, early sources such as the Columbia Encyclopedia, 1960, give her date of birth as 1896, making it possible that "one year" was subtracted twice. ^ Karon, Tony (October 24, 2003). "Madame Chiang Kai-Shek, 1898-2003". Time. Retrieved August 12, 2017. ^ Tyson Li, Laura (2006). Madame Chiang Kai-shek: China's Eternal First Lady. New York: Grove Press. p. 5. ISBN 978-0-8021-4322-8. ^ "Southeast Tennessee Tourist Association". Southeast Tourist Tourist Association. Archived from the original on October 3, 2011. Retrieved July 9, 2011. ^ Profile, wellesley.edu; accessed July 28, 2014. ^ "CHINA: Soong Sisters". TIME. December 12, 1927. Retrieved May 22, 2011. ^ "CHINA: Potent Mrs. Chiang". TIME. November 26, 1928. Retrieved May 22, 2011. ^ St. Bartholomew's Church Marriage Registration 1944. ^ Meiling Villa, synotrip.com; accessed July 28, 2014. ^ Scott Wong, Kevin (2005). Americans first: Chinese Americans and the Second World War. Harvard University Press. p. 93. ISBN 9780674016712. ^ Karon, Tony (October 24, 2003). "Madame Chiang Kai-shek, 1898-2003". Time.com. Retrieved July 27, 2011. ^ "Madame Chiang Kai-Shek". Wellesley College. August 14, 2000. Retrieved August 1, 2017. ^ Berger, Joseph (October 30, 2003). "An Epitaph for Madame Chiang Kai-shek: 'Mama'". New York Times. Retrieved April 3, 2015. ^ Isogawa, Tomoyoshi; Aoyama, Naoatsu (March 7, 2014). "Chinese Civil War and birth of Taiwan, as told by Leo Soong". The Asahi Shimbun. Archived from the original on April 7, 2015. Retrieved April 3, 2015. ^ "President's Statement on the Death of Madame Chiang Kai-shek". The White House. Retrieved July 4, 2011. ^ Pakula, Hannah. "Chiang Kai-shek". New York Times. Retrieved November 11, 2014. ^ a b Kirkpatrick, Melanie (November 3, 2009). "China's Mystery Lady". Wall Street Journal. Retrieved November 11, 2014. Chu, Samuel C.; Kennedy, Thomas L., eds. (2005). Madame Chiang Kai-shek and her China. Norwalk, Connecticut: EastBridge. ISBN 9781891936715. Scott Wong, Kevin (2005). Americans first: Chinese Americans and the Second World War. Harvard University Press. ISBN 9780674016712. Retrieved May 20, 2015. This page was last edited on 15 March 2019, at 02:04 (UTC).